Imperator: Rome, the next Paradox grand strategy game, is due out this April. Paradox Interactive revealed today that its upcoming grand strategy title, Imperator: Rome, will release on April 25th. "Set in the tumultuous centuries from Alexander’s Successor Empires in the East to the foundation of the Roman Empire, Imperator: Rome invites you to relive the pageantry and challenges of empire building in the classical era. ", its Steam page reads. Despite the name, players can lead more than just Rome, managing different government types such as republics, monarchies and tribal systems. 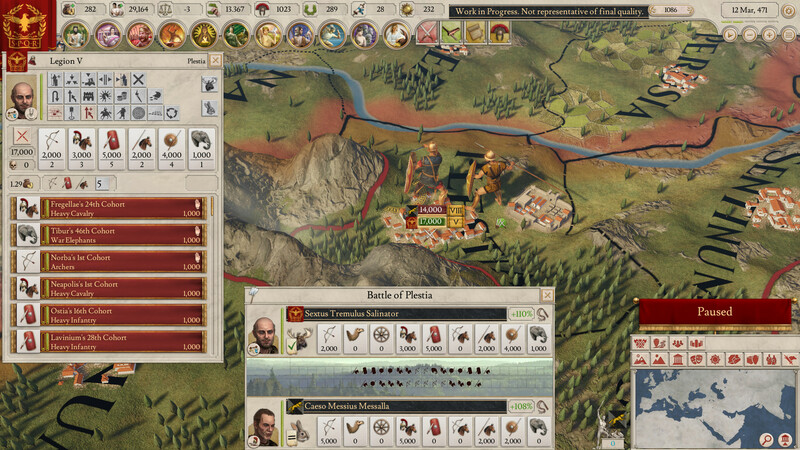 Population management will also play a significant role in Imperator: Rome. The four available population types, citizens, freemen, tribesmen and slaves, come with their own cultures, religions and needs in order to be kept happy. Different cultures have their own way of waging wars, relying on their own military traditions, while notable characters will require proper management if you want your faction to flourish.The title is currently available for pre-order on Steam, GOG.com as well as Paradox Plaza, with two editions being available. Everyone who pre-orders receives the Epirus Flavor Pack, which adds unique army and ship models for Epirus, the Oracle complex of Dodonna as a special monument, 6 Event Chains related to the life of Pyrrhus of Epirus, alongside one new music track. Imperator: Rome's Deluxe Edition further includes the Hellenistic World Flavor Pack, adding 4 army and ship models for specific factions, special on-map monuments, flavor events and the Alexander's Body event chain, alongside new event art and music.